Learnathon: Winners of the Week! Congratulations to last weeks Learnathon Winners. We’d like to give a shout out to the following schools and districts for their students’ outstanding efforts in taking them to the #1 spots! With 3301 hours of learning and a grand total of 88,670 ELA problems solved to date, Ellis Elementary School students are hard at work practicing their concepts and raising their rate of learning. 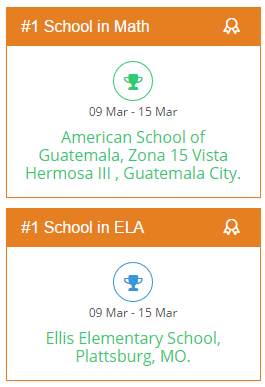 The American School of Guatemala has a total of 747,898 Math problems solved with 14,701 hours of learning to date. 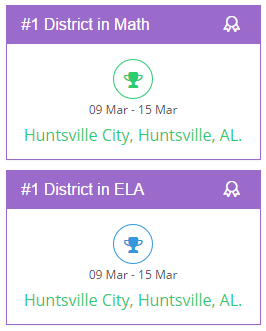 At a district level, Huntsville City has stolen the show, with a total of 3,382,795 math problems solved, 3,423,756 ELA problems solved, and 20,7040 hours of learning. The best part? They’re still ranked #1 in both Math and ELA at a district level! Great job Huntsville City! What is your school or classroom impact? The more your students practice and master their concepts, their rate of learning will also increase, and they will be able to celebrate their successes at the Global Leaderboard! Are there any goals you would like your students to hit before Sunday night? ScootPad gets Simpler and Easier to Use!